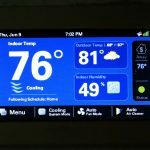 Problem with your air conditioner leaking water in your house? Part of an air conditioner’s function involves removing the moisture that is suspended in the air. Once removed from the air, the moisture drips from the cooling coil contained in the air conditioner and is collected in the base. Some of the moisture is used to cool the heating coil, while the remainder is channeled through passages to the air conditioner’s rear. From there, the air conditioner is designed so that the moisture can drain out from its rear. Of course, this is only the case so long as the air conditioner remains functioning as it was meant to. 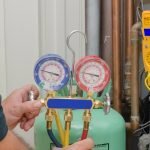 Some of the problems that can afflict your air conditioner can also cause the excess moisture to leak into your room rather than out of its rear. An encounter between hot, humid air and cooler, less humid air can cause condensation to form. Poor insulation around the air conditioner can cause hot, humid air to enter the room. Once it brushes up against the cooler, less humid air of the room, the moisture in the air condenses and clings to the air conditioner. You might have this problem if water is dripping from the body of the air conditioner. Since draining of the excess moisture is dependent on the drains built into the air conditioner, blockage of those drains is one of the most common problems that can cause leaks. Simply put, collected moisture that cannot escape through the rear is going to build up and overflow once it exceeds the air conditioner’s ability to hold it. You might be able to fix this problem depending on the location of the drain blockage. For example, if the blockage is close to the opening of the drain, you might be able to open it using a small piece of wood or some similar material. However, if the blockage is internal, you are going to need to hire professional help. Cold temperatures can cause ice to form inside the air conditioner. If you notice that the leaking water is only happening at night, this could be a sign that the cooling coil in your air conditioner is freezing up during the night. The air conditioner’s filter becoming clogged with airborne dust can also help contribute to the same problem. Since the excess moisture is intended to drain out the rear, the air conditioner needs to be installed so that it rests tilted at an angle. A fine balance is needed to ensure the air conditioner’s normal function. If the air conditioner is tilted towards the room, the excess moisture is going to flow into the room. In contrast, too steep a tilt towards the outside is also going to cause problems. As a general guideline, a height difference of a single inch between the front and the rear of the air conditioner is enough to ensure its normal function.